So you finally get the chance to eat fresh sashimi in Japan or try boerewors in South Africa, and you love it – so much that you want to show appreciation to your server for an unforgettable meal. But is tipping customary where you are? And if so, how much should you tip? 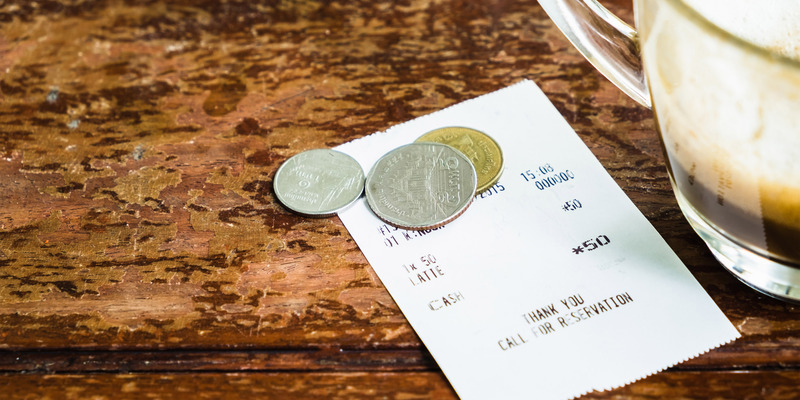 Check our global gratuity guide to brush up on your tipping etiquette before you go abroad. In a nutshell: Throughout North, Central, and South America, it is customary to leave gratuity since tips can be a substantial part of a server’s income. If you’re from the United States, you’re probably familiar with the unspoken rule of tipping: the better you tip, the better service you’ll receive next time you come back. Trip Advisor recommends adding 15-20% to the restaurant bill; same for taxis. Similar to the U.S., patrons in Canada and Colombia also tip staff 15-20%. In Argentina, Mexico, Nicaragua, and Peru, servers are used to a little less, with 10-15% gratuity being the norm. Most restaurants in Brazil, Chile, and Costa Rica include a 10% sit-down charge to the bill (referred to as a cubierto in Chile). In these cases, no one expects a tip but feel free to put down an extra 5-10% in cash since the servers might not receive their share. TIP: If you do leave a tip in Brazil, make sure to be discreet since Brazilians are very subtle when it comes to business transactions. In a nutshell: Leaving larger tips of 15-20% is unnecessary and sometimes considered ignorant since many countries within the European Union already have laws in place to accommodate gratuity. In an effort to do away with tipping politics, the Netherlands requires establishments to include tips to their published prices. However, it’s common for people to still leave a small tip of about 5-10% for good service, called fooi in Dutch. Other EU countries which generally add a service charge to the bill include the Czech Republic, France, Hungary, Spain, and Sweden. In these countries, tipping is not customary, but considered a generous act in exchange for exceptional service. Germany, Ireland, Portugal, and the United Kingdom do not have a strong tipping culture so leaving gratuity is up to you. The rule of thumb is to leave a 5-10% tip unless a charge is included in the bill or the service is really bad. Drivers and bartenders in these countries don’t usually expect gratuity, but rounding up the bill is always appreciated. In Austria, Italy, and Russia, tipping isn’t regularly practiced, but it’s also common for people to generously round up the bill since wages are so low. Some tourist areas in Italy will add coperto, meaning a “cover charge,” to the bill, but this gratuity isn’t always shared with the staff – so, if you do wish to tip in Italy, leave cash to make sure the server actually receives it. FUN FACT: In Germany, the word for tip is trinkgeld, which translates to “drinking money”; in France, the word for tip is pourboire, which similarly means “to have a drink”. In a nutshell: Similar to the Americas, tipping is customary and expected by servers in Africa and the Middle East. The amount varies by restaurant and economic state of the country. In Qatar, Saudi Arabia, and the United Arab Emirates, servers are used to receiving a 15-20% tip. Even in cities like Dubai, which requires a 10% service charge be added to the bill, restaurant workers expect an additional 15-20% gratuity for their efforts. In African countries like Jordan, Morocco, and South Africa, wait staff will expect at least 10-15% tip. Nicer restaurants in popular tourism countries like Egypt and Israel will also add a service charge to the bill so keep an eye out to prevent double tipping. FUN FACT: In Iranian culture, gifts mean a lot more than monetary compensation. Travelers are encouraged to express their appreciation at hotels with a small gift from their country. In a nutshell: Outside of tourist areas, countries in East Asia and the South Pacific do not have much of a tipping culture so gratuity is not expected and may even be turned down. In China, Myanmar, Singapore, and Taipei, tipping is deemed unnecessary; however, a few trendy restaurants in China are starting to accept tips, so who knows what the future holds? Other Asian countries, like Japan and Nepal, strictly believe good service is simply part of life, so tipping should only reward good service. In Japan, some servers might even politely refuse your tip. Due to an influx of tourism, countries like Cambodia, Indonesia, Thailand, Vietnam, and parts of Turkey are becoming more open to receiving tips; however, tipping is still not considered customary, so it’s not a faux pas if you don’t leave one. In Australia and New Zealand, servers and drivers also don’t expect tips, but appreciate it if you round up the bill. Tipping customs can change as tourism shapes cultural norms and wage laws change. If you find yourself unsure whether or not to tip, ask your server if tipping is customary. If it doesn’t feel appropriate to ask, simply round up the bill. There’s nothing wrong with bringing a little of your culture to the table by leaving something behind to show your gratitude. And who knows, you might be making someone’s day!